Home / News / WHY ALOY? Martin Edwards, Development Chemist, Camari (part of the Safapac Holdings Group), explains the consequences of micronutrient deficiency, and reveals a novel approach to dealing with the problem. Like animals, plants require a certain amount of trace minerals to develop healthily. Plants lacking in essential trace elements are consequently more susceptible to disease than those growing where the correct levels are maintained. Diseases caused by such micronutrient deficiency need controlling – hence larger volumes of pesticide products will be required. It is therefore of major importance that the appropriate levels of minerals are delivered to the crops as they mature. ‘Aloy’ products are an efficient answer to micronutrient delivery, allowing an effective supply of minerals with minimal waste. The properties of these formulations mean they are of increasing interest in the agrochemical market, notably because they are often more cost effective over a season than the more traditional products that are commonly used. Micronutrients: e.g. manganese, zinc, copper, boron, molybdenum etc. It is essential that these three categories of nutrients are effectively and efficiently delivered to crops in order to gain the best yields. In the case of the primary nutrients, soil dressing is generally the best practice. This is due to the large quantities involved as well as the need for early application. Soil analysis will accurately determine the levels required here. nutrients available to the crop. Consequently, any nutrient deficiency can only be monitored when the visual symptoms occur as the crop matures. Because significantly less micronutrients are required by the crop, and as they are more expensive, incorporation into the soil would be costly. The preferential application method is therefore foliar. Common practice for the introduction of secondary and micronutrients into plants is to spray a salt solution such as manganese nitrate, or sulphate, onto the plant at regular intervals throughout the growing season if deficiency is detected or anticipated. For all micronutrients to work they need to be absorbed by the plant and transported through the sap stream to their site of action. Solubility in water is the key to this. Existing methods of mineral supply are typically in the forms of soluble liquids / powders (SLs) or suspension concentrates (SCs). 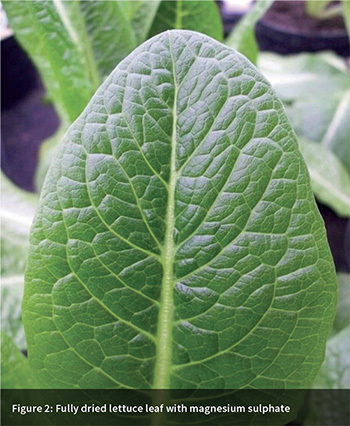 Generally speaking, soluble salts are fast acting, but difficult to deposit and keep on the leaf. SCs, however, are slow acting but much easier to deposit and keep on the leaf. Both formulations lead to unused product being wasted. In the case of SL products, wastage is largely due to the high ionic character – giving high surface tension spray solutions. These solutions are resultantly difficult to deposit on leaves, ‘bouncing’ off similar to a balloon. The tight droplets of product that eventually settle on the leaves are slow to dry and don’t absorb quickly through the cuticular wax. Once the droplet has deposited on the leaf, the plant will emit organic acids, which will react with the metal ions turning them into simple soaps. This will ease the passage through the wax barrier and allow the micronutrients to be absorbed. However, the solution will have poor rain fastness and may be washed away within this time frame. Another disadvantage of a soluble salt is that modern day spraying practice usually entails more than one (sometimes up to seven) active chemicals being applied at the same time. They can cause physical incompatibilities in the spray tank, especially with highly alkaline solutions or emulsifiable concentrates. will therefore not wash off the deposit. The micronutrient, however, will not be transported to the point of action very quickly due to the low solubility of these formulations. Additionally, suspension concentrates do not cause the sprayer any compatibility problems provided the active ingredients are added in the recommended order. It is largely accepted that for effective plant growth, the application of micronutrients should be within the first 30 days post crop emergence. 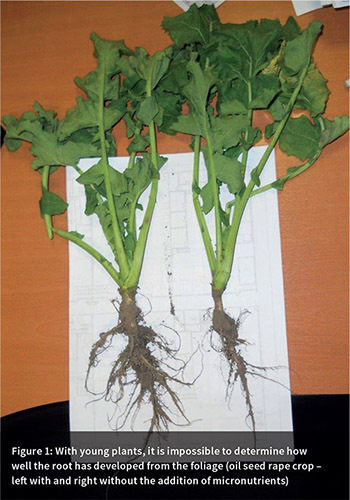 Establishing a good root structure is of primary importance in producing a healthy crop that can withstand stress brought on by weather or attack by pests – this is something that can’t always be identified visually from the exterior plant (see Figure 1). Both current SL / SC formulations have problems with helping to establish this biomass – SLs tend to be washed away too soon whilst SCs take too long to be absorbed through the leaves to give the required doses. What are ‘Aloy’ formulations and what are their benefits? ‘Aloy’ is a name used by Safagrow (a Safapac Holdings company) to describe a new concept in micronutrient delivery. These formulations are a hybrid of both a soluble liquid and a suspension concentrate – a class known as suspo emulsions (SEs). More specifically, these are in the form of an insoluble powder component suspended in a dilute metallic salt solution. By combining these two formulation types, Aloy products can reap the benefits of each whilst minimizing product wastage. Similar to SCs, surfactants are present in Aloy formulations to aid with the suspension of particles; the surface tension of the spray solution is reduced. 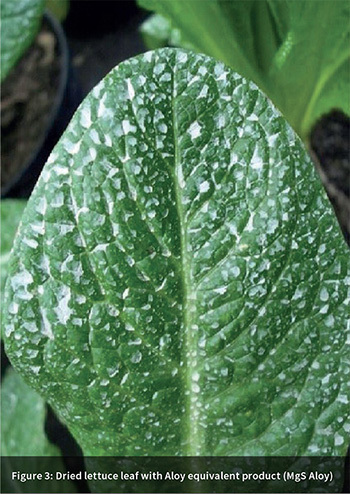 A better deposition of product on the leaf is resultantly achievable – leading to faster drying of the droplet. This in turn allows for an increased rain fastness whilst the surfactants also soften the leaf cuticular wax layer, which causes a better overall uptake of the micronutrients. The portion of soluble salt present also is low enough not to cause any tank mix problems. By introducing a small amount of highly soluble salt into SCs in this way, Aloys give the crop an initial ‘boost’. This is particularly important with micronutrients like manganese, where the visual greening of the crop gives the user confidence that it is working. These formulations are more concentrated so have reduced handling, storage and transport costs.